Johnson's Map of New York State. This hand colored map is a steel plate engraving, dating to 1862 by the legendary American mapmaker A. J. Johnson. It depicts the state of New York. 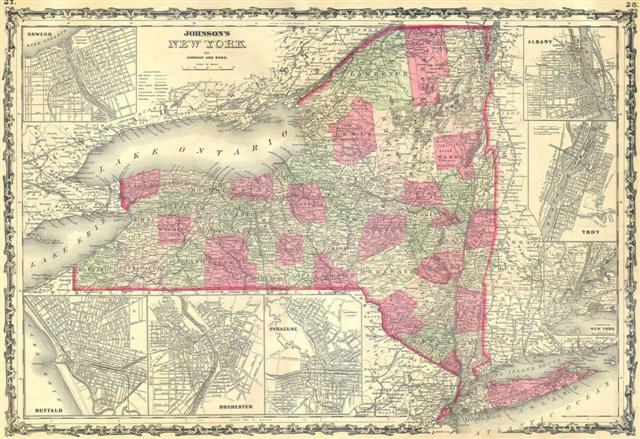 There are inset maps of Buffalo, Rochester, Syracuse, Oswego, Albany, Troy, and of course, New York City. This map is exceptionally rare as it come from the 1862 edition of Johnson's Atlas – one of the first and rarest.